Skirt with front inverted pleat has waistband and side placket. 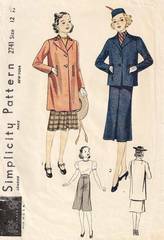 Lined straight coat or jacket has welted pockets at waist, two piece straight sleeves and front button closing. Purchased top. Pattern is used and complete. Very little color aging to pieces, instructions and envelope. Envelope has tape reinforcements/repairs on edges. Pattern pieces and instructions are in very good condition.